Other names for the cornetfish from the Fistulariidae family are flutefish or trumpetfish. The body is what is called ‘elongate’, meaning long and stretched, including an extremely long snout and tiny mouth. It is used to poke in corals, searching for food such as tiny fish and crustaceans. The needlefish from the Belonidae have an almost simular slender body as their counterpart from the ranks of the Fistulariidae. This species prefers the surface of the Red Sea waters fort he simple reason that the reflection of the sun rays have a camouflaging effect. Surfing on the waves, the needlefish catches small fish. 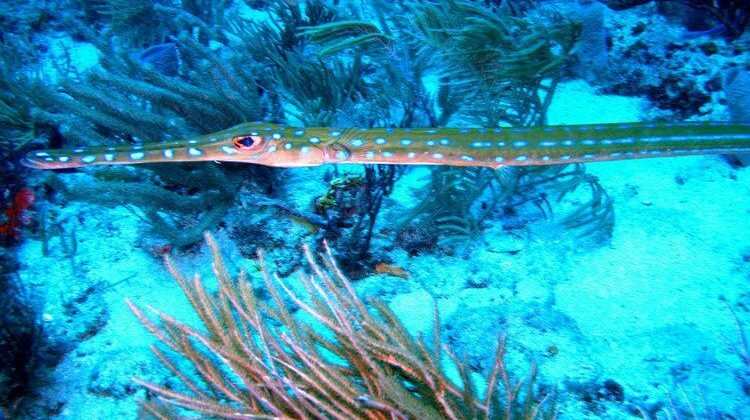 When a needlefish feels threatened it does not refuse to jump out of the water to protect itseld. The very slender and elongate body, together with the extension of the very long snout, make up for a maximum length of 150 centimeters. The coloration isn’t very spectacular with a bi-colored combination of olive green and silver. The flutemouth lives in environments with an abundance of hard corals from the surface to bottoms at a depth of 100 meters. The flutemouth loves small fish, crustaceans and tiny sorts of octopus, swallowing them as a whole. It does this on its own or in smaller groups. This pelagic fish has got quite a mouth, like a sword almost, with extremely sharp teeth. The needlefish is capable of piercing other fish with its razersharp teeth. It measures 120 centimeters and is found in very shallow waters up to only 5 meters in depth. It has a rather dull green and silver coloration.